Protecting your home away from home with a quality Caravan Cover can save you thousands of dollars down the track by keeping your Caravan, Camper Trailer, Poptop or Motorhome in brand new and pristine condition. A quality caravan cover in Australia will have a minimum 3 year warranty which tells you that it will handle Australias harsh UV conditions over long periods. The design of a fit for purpose caravan cover will allow ventilation to circulate reducing the chance of moisture that can promote the growth of mould and mildew. How do I choose the right cover for my Caravan, Poptop, Camper Trailer or Motorhome? How do I measure my caravan ensuring I buy the right cover for a perfect fit? How do I fit my new cover? My previous cover lasted less than 12 months, how can you garauntee 3 years? Determine the length of your RV type and size it accordingly with the cover types available. Measure the external length of the general body only. The general body does not include accessories like air conditioners, antennas, solar panels, gas bottles, bike racks, spare tyres or rear bumpers. TIP - The external length often differs from the internal floor plan length quoted by the manufacturer due to storage compartments accessible from the outside only. Determine the quality of the cover needed for your application. UV rated covers with a minimum 3 year warranty are recommeded for Australian conditions when being stored in the open elements. Consider a basic cover if you intend to store under a carport or in a shed and just want to keep the dust off. TIP - Covers that are not fully UV protected for Australian conditions and that are stored out in the open can start to perish in as little as 12 months. Fitting your cover. There are a few different methods and we find the easiest way is to start with your cover rolled up and placed on top of your RV - A step ladder will be required for for most caravans, poptops and motorhomes. Simply unroll your cover along the length of your roof and then roll down your front back and side panels last. Unroll your your straps and buckles and connect to the opposites sides of your cover all round and secure firmly to prevent flapping of your cover. Removing your cover. Simply unclip all your straps and buckles and roll the front, back and side panels up onto the roof (you made need a step ladder for this), and then roll the whole cover up length ways along your roof. Fold your rolled up cover in half and store. What size cover do I need for my Caravan, Camper trailer, Pop top or Motorhome? 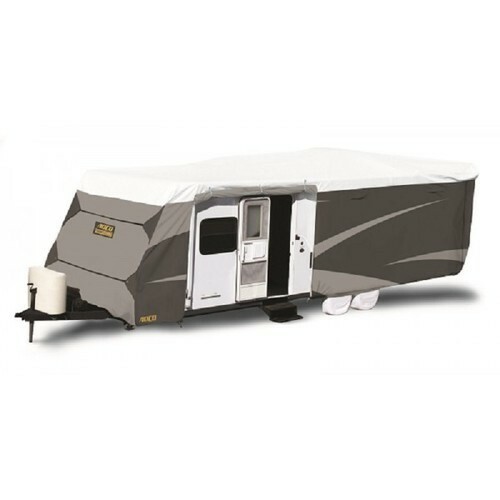 The best fitting cover is the cover that is filled out by the caravan body shape only. Try not to stretch your cover over gas bottles, tool boxes or spare wheels on the back as this will cause a hollow pocket above these items which may lead to excess flapping and rubbing causing premature failure within the caravan material. Measuring your caravan at the longest points of the body only will allow you to suit this measurement to the manufacturers recommended cover for that length and type of caravan, pop top or camper trailer. Try not to solely rely on the manufacturers length specifications, as it is common for manufacturers to quote the interior floor plan measurement instead of the exterior body measurement. The exterior body length can be considerably longer in some cases due to the popularity of external storage spaces and boots. Exclude the A-frame and coupling - This wont be covered by the main cover. (a small coupling cover is included.) Things like the rear bumper, gas bottles, tool boxes and spare wheels generally are able to be covered due to the greater elasticity of ADCO Covers, although this is not recommended as the excess space above these items will cause excess flapping and can rub excessively on these items. The tighter the fit to the body of your caravan not including your accessories, the better chance it has to reduce excess flapping and increase the life of your cover. ADCO covers are designed to accomodate all rooftop accessories eg: Airconditioners, Antennas & Solar Panels up to approximately 300mm. These covers are adjustable using straps and buckles eliminating the need for ropes making it that little bit quicker and easier to install. Camec Australia have now Introduced what they call 'the best quality adjustable standardised cover to ever hit the caravan industry market' - The ALL NEW 2017 Camec Caravan Cover is leading the way for quality and durability at an affordable price and is recently voted Australias Best Caravan Cover for 2017. If you have had a caravan cover before, you may be all too familiar with the effects UV has on prematurely disintegrating your cover - often within 12 months on some of the cheaper brands. Soft non-abrasive lining coupled with double stitched reinforced corners puts this a class above even the ADCO Caravan Cover. Offering a generous 3 year warranty in full open harsh Australian conditions. Why choose a CAMEC Caravan Cover? CAMEC are the leaders in the caravan accessories industry, being heavily involved for over 30 years - they know what they are doing when it comes to protecting your caravan, poptop or camper trailer. Years of product development have lead to Camec skyrocketing to the top of the ranks for caravan covers as far quality and durability is concerned. Camec have capitalised on the effective engineering design allowing ventilation to effectively remove any mould harbouring moisture. These covers are still 100% water proof on top, although the side panels are what we call 'breathable' allowing ventilation to circulate. Need to cover your RV from the weather? The good news is that you don’t need to build a new garage or find space in your existing one to keep it safe - with our affordable Camec and ADCO camper trailer covers, you can have complete peace of mind without needing to spend a fortune. In fact, the cost for a cover is often as low as 1% (or even less) of the total cost of your RV, so it’s perfect if you’re not a constant nomad and you’re not fortunate enough to have a spare garage with the space. Quality Camec & Adco Caravan Covers For Sale in Australia - The Perfect Gift! When you own a recreational vehicle or trailer, it’s important to keep it sheltered as it is stored between periods of use. If left unprotected, it can be damaged by weather conditions such as storms and excessive heat. 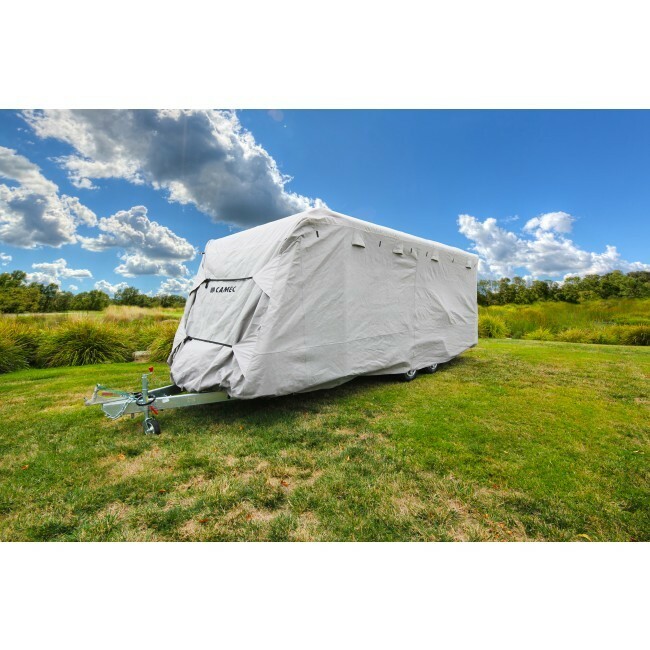 A caravan, poptop or camper trailer makes the perfect gift, an RV cover is always very much appreciated when it comes to protecting your home away from home. Whether you own a camper trailer, a pop top caravan or a full height caravan, we stock durable, weather-resistant products that you can depend on for long lasting performance. Currently we have both the Camec and Adco design available, there is something to suit any requirement right here at Caravan Rv Camping. To ensure you choose the correct size, measure the length of your trailer or RV and choose the product with the appropriate specifications. The Caravan Covers we offer are designed with minor adjustment up to 600mm, simply choose the cover thats suits your type and length RV. Whether you are a seasoned adventurer who spends months on the road or simply an occasional weekender, your RV is your home away from home — so why not treat it as such? Browse our Caravan Covers for sale in Australia and enjoy long lasting quality that you can rely on, and all at a competitive price that doesn’t break the bank. If you would like to make an enquiry about anything in our range or would prefer to place an order over the phone, give us a call on 1800 RV PARTS (1800 787 278) and we will be more than happy to help. Which brand Caravan Cover is best for my caravan or motorhome? We generally find that the caravan covers offering the longest warranty are a good place to start. Australias harsh climate can dramatically reduce the life expectancy when in full open weather, so manufacturers that are offering 3 years warranty at a minimum, are basically telling you that these covers are made for Australian conditions and wont disintegrate from UV damage after a few months. How do I install a cover for my Caravan, Camper trailer, Pop top or Motorhome? 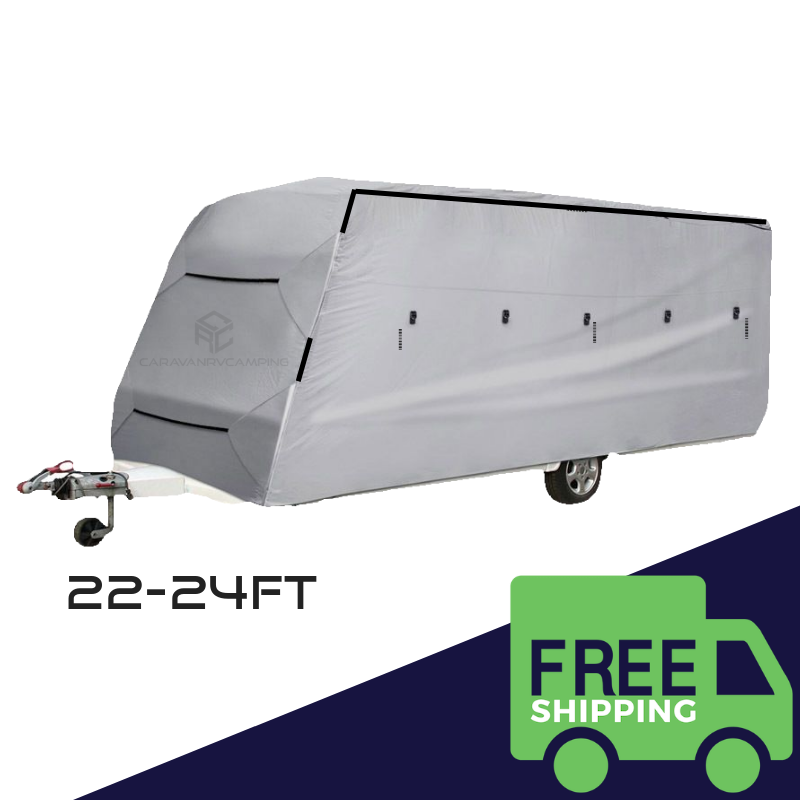 The easiest way to install any of these covers is to roll them up in such a fashion that it can be placed on top of your RV at the rear, and rolled out from rear to front. You can then roll down the sides and end walls and secure/adjust accordingly. To take the cover off, you can roll the side and end walls up onto the roof, and roll the cover back up like a sausage from front to rear. You will need a ladder for larger RV's and it is always easier if a second person is there to help you - although it is not too much dramas to do by yourself. My previous cover has not lasted even 12 months - Will these be the same? No, these covers are guaranteed to last a minimum 3 years, although with the right fitting cover that has been installed correctly, we are finding that the ADCO cover and Camec Caravan covers are lasting a lot longer than this. There is definately a distinct quality difference with our covers and more importantly our caravan covers are UV protected for Australias conditions. Do caravan covers scratch or damage the exterior of caravans? The short answer is NO, although without proper care of your caravans exterior, marks and scratches can result due to a caravan cover being in contact no matter how soft the internal layer is. With a fibreglass caravan, if the outer gel coat has worn away to the extent where it looks powdery, off colour marks can result by simply being in contact with a cover. This is not the covers problem, you need to treat and buff the exterior of your caravan before it gets any worse. A well looked after exterior will have no problem with our softly lined covers. Aluminium cladded caravans have no problem with caravan covers, just make sure there are no sharp edges that may damage yopur cover - cover or pad them if you have to. Caravan windows will not be scratched by our covers if they are kept clean. It is the dirt that gets trapped between the cover and the window that causes scratches and abrasions. Perspex windows unfortunately create static which can attract dirt and dust particles which can make it hard to keep clean. We reccommend using an anti-static compound like VuPlex on your perspex or acrylic windows to solve this problem. What is Vuplex? How does this protect my caravan windows from getting scratched? VuPlex is an anti-static compound that reduces static and also the friction between your caravan cover and caravan window. Perspex windows can create static that can attract dirt and other grit particles. These dirt and grit particles are what causes abrasion/scratches to your windows when your soft inner layer of your caravan cover rubs against your window. Using the VuPlex compound will prolong the clarity of your caravan windows for longer periods. Otherwise making sure your caravan is clean prior to installing your cover will help to keep your windows crystal clear. 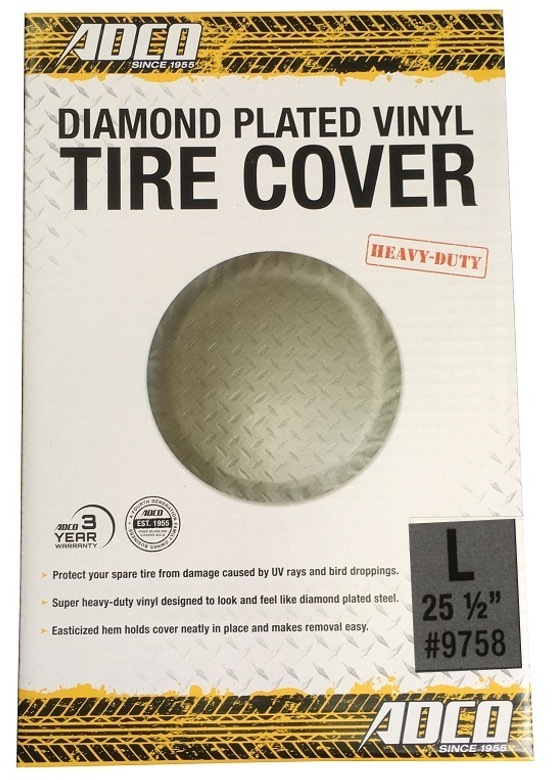 ADCO Spare Tyre Cover Diamond Plate 25 1/2"
ADCO Camper Trailer Cover 12-14' CRVCTC14 (3672-4284mm). ADCO Camper Trailer Cover 10-12ft CRVCTC12 (3060-3672mm).